We are a leading Manufacturer of cap shrink tunnel machine, shrink tunnel packing machine and semi automatic industrial shrink tunnel machine from Ahmedabad, India. We are a well-known industry in the market as the foremost manufacturer of Cap Shrink Tunnel Machine. The offered tunnel is precisely designed by using the finest quality components and advanced technology in sync with industry norms. This tunnel is available in different sizes and designs to cater the demands of clients. We offer this tunnel to our customers at market leading prices. Bottling/Distilleries/Cosmetic/Oil/Automobile/Home & Laundry Care Product/Food/Dairy/Paint/Agro/Chemical/Water/Seeds/Ice Cream Industries. We are a well-known industry in the market as the foremost manufacturer of Shrink Tunnel Packing Machine. The offered tunnel is precisely designed by using the finest quality components and advanced technology in sync with industry norms. Used for chemical industries and pesticides industries, this tunnel is available in different sizes and designs to cater the demands of clients. We offer this tunnel to our customers at market leading prices. Hi-Fi machine designs for 50kg to 500kg conveyor load. Conveyor on hollow pin chain basis with solid rods or heavy Rollers. Conveyor rods covered with Asbestos Gland or silicon tube. Conveyor operate with variable speed D.C drive or A.C variabel Drive. Heavy duty teflon or fiber glass wire used in wiring. 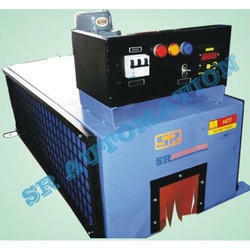 Our speciality in special purpose Shrink Tunnel machine for heavy load And very big size article. Our other specialities in shrinkage of empty pet Bottles. Chemical contairs like Neptha, specially for chemical industries and pesticides industries. We are also undertaking the job of heat chambers & drying lines. 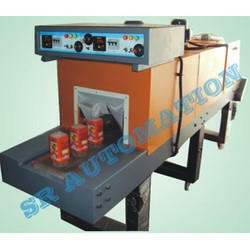 We are manufactured G.M.P models in our all the range of machines.